The Czech Republic, also known as Czechia , is a nation state in Central Europe bordered by Germany to the west, Austria to the south, Slovakia to the east and Poland to the northeast. It is a unitary parliamentary republic, has 10.5 million inhabitants and the capital and largest city is Prague, with over 1.2 million residents. 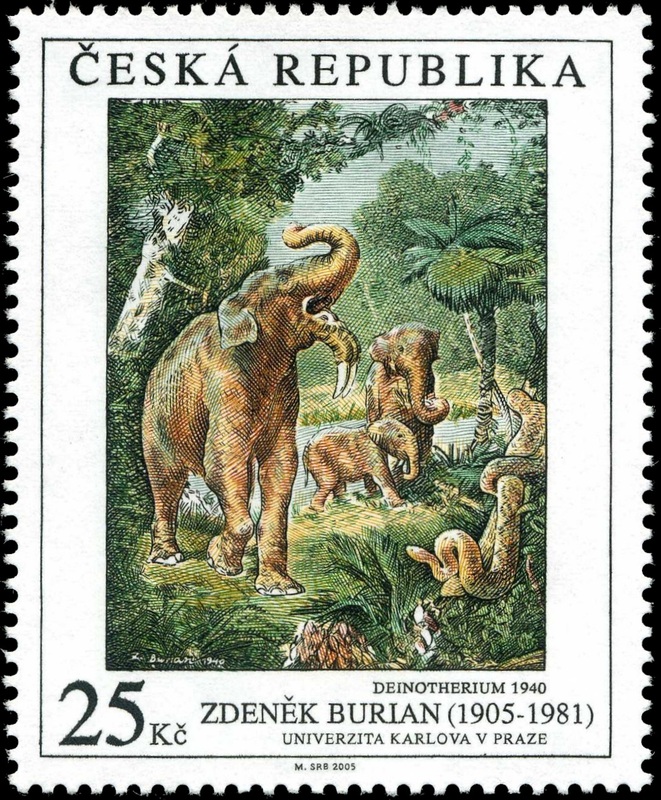 All three stamps based on illustrations of famous Czechoslovakian paleo-artist Zdenek Burian. So far there are no stamps with him, but postmark issued by Czech's post in 1995. Stamp with face value of 12 CZK from "Personalities" set shows Charles Darwin. Distinguish from Michel catalog, Czrech's Post define these two stamps as a set. Kaspar Maria von Sternberg (born on January 6th, 1761 at Brezina Castle) was one of the leading scientists of the first half of the 19th century, with a special interest in botany, geology and paleontology, and is considered as one of the founders of paleobotany. [A1] Georg Bauer (1494- 1555), depicted on "blue" stamp with face value of 6 kc , better known by the Latin version of his name Georgius Agricola, is considered the founder of geology as a discipline. His work paved the way for further systematic study of the Earth and of its rocks, minerals, and fossils. In 1544, he published the De ortu et causis subterraneorum, in which he laid the first foundations of a physical geology, and criticized the theories of the ancients. However, he maintained that a certain 'materia pinguis' or 'fatty matter,' set into fermentation by heat, gave birth to fossil organic shapes, as opposed to fossil shells having belonged to living animals. In 1545, he followed with the De natura eorum quae effluunt e terra; in 1546 the De veteribus et novis metallis, a comprehensive account of the discovery and occurrence of minerals and also more commonly known as De Natura Fossilium; in 1548, the De animantibus subterraneis; and in the two following years a number of smaller works on the metals. [A2] "Nature Protection - The Krivoklatsko Region - A UNESCO Biosphere - Eudia pavonia Reserve" shows various landscapes of the region, also known as fossil found place. Fossils with well preserved soft parts were ascertained in several different levels of two Cambrian units of the Příbram-Jince Basin as well as in diverse levels of the Skryje-Týřovice Basin, the area belongs to the region. Some trilobites are depicted on commemorative postmarks used on one FDC of the set. [A3] The mini sheet "Nature Protection - Karlstejn Region" shows various landscapes of the region, also known as fossil found place. The area boasts many precious, geologically significant profiles and world-famous fossil deposits shared with the neighbouring Bohemian Karst area. The prevailing sedimentary structures contain numerous karst caves. The Koněprusy Caves, hidden in the Zlatý kůň (Golden Horse) hill about 5 km far from Beroun, are the best known ones. Visitors can see about 600 meters of the more than 2 kilometre long caves. Inside, archaeologists found many animal bones dating back more than half a million years and human bones about 13 thousand years old. Some trilobites are depicted on one FDC of the set. [A4] Iron Mountains are the key to geological history of central Europe. Proterozoic gneisses and volcanosedimentary complexes (subaerial and submari ne volcanism) are present. The earliest life forms have been found – stromatolites. The Paleozoic comprises Cambrian siltstones, Ordovi cian quartzites, Silurian shales, Devonian limestones and Carboniferous sediments. Ra re fossils include trilobite and graptolite fauna. The third oldest ichnofossil of Zoophycos type in the world has been reported. The Mesozoic (Upper Cretaceous) sedimentary cover h as a unique development, with abundant fauna and flora. Sandstones and spiculitic marlstones provide excellent conditions for groundwater accumulation. Tertiary rocks are represented by basalt enclosing olivine-rich xenoliths. Geological story of the area is completed by Quaternary loess and sandy gravel. Over a hundred geosites have been described from this area. The above facts became grounds for listing the Iron Mountains as a National Geopark. More info is here. Fossilized ammonite depicted on a postmark used fro FDC. [A5] Oldřich Pošmurný was born on 8 April 1942 in Tábor. He studied graphic design of books and magazines with Prof. Vladimír Ringes, history of book design with Prof. František Klikar, and illustration and figure drawing with V.J. Žižka. After graduation Oldřich Pošmurný worked as a graphic editor in the Svoboda publishing house. From 1968, he worked as a free-lance graphic artist. He co-designed the series Zdeněk Burian’s Ancient Dinosauresand designed Dinosaur's stamps of Czech Republic in 1994. The postage stamp is issued both in the form of sheets and as a book of 8 stamps and 4 coupons. [A6] The museum was founded in July 1817 in Brno. Its collections include over 6 million objects from many fields of science and culture, include some fossils in Paleontologic and Paleoanthoropolgic exhibits. [A7] On October 10th .2018 Post authority of Czech Republic issued a stamp "200 years of the National Museum in Prague". The stamp depicts the building and expositions of the National Museum. Th5e National Museum is the largest Czech museum. Museum started with donations of large private collections, dedicated mostly to natural science, by a group of local aristocrats led by Count Kaspar Maria Sternberg, who also led an effort to set up a museum. [A8] In 2003 the Committee of the International Coordination Council of UNESCO's Man and the Biosphere (MAB) programme in Paris approved the extension of the Pálava Biosphere Reserve to include the Lednice-Valtice Cultural Landscape and the floodplain forests at the confluence of the Morava and Dyje rivers. The newly designated area, covering over 300km2, was renamed the Lower Morava Biosphere Reserve. The reserve encompasses a unique combination of limestone cliffs of the Pálava Hills (In the Upper Tertiary period, the hills were surrounded by a warm sea. During the Quaternary fossils were deposited on the footslopes of the Pavlov Hills), the rare Central European lowland floodplains along the lower reaches of the Kyjovka, Dyje and Morava rivers and the Lednice-Valtice Cultural Landscape. There are many personalized post stationary (post cards with imprinted stamp) issued in Czech, here are only some of them. These post stationaries are based on standard post stationary produced by Czech's Post Authority without any image on the left side. [CA1] Zdenek Burian (1905-1981) was a Czech painter and book illustrator whose work played a central role in the development of palaeontological reconstructions during a remarkable career spanning five decades. 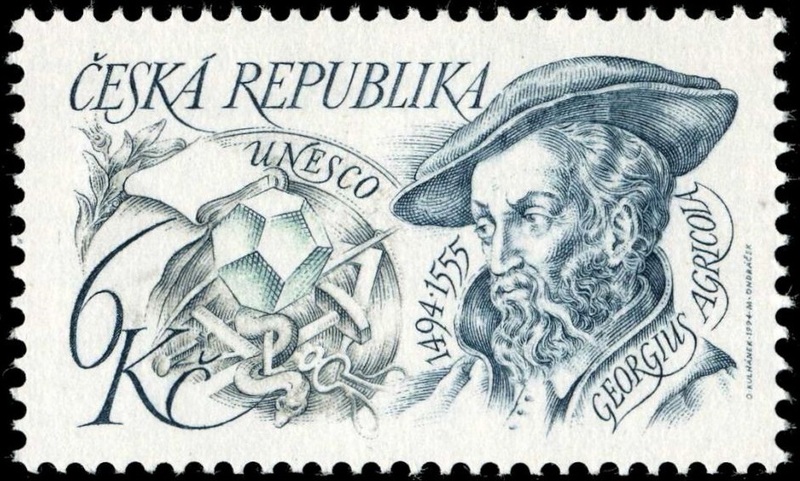 Many of his illustrations used as source of international stamps, include Czech stamps of 1994. The text above the postmark: "There are members of Fauna-Flora Expert Section at Union of Czech Philatelists in this town, too." Similar postmarks issued in Prague, Plzen and Kladno cities.